Hand’s Summer Adams is defended by Wilbur Cross’ Tyannah Tucker on Friday. 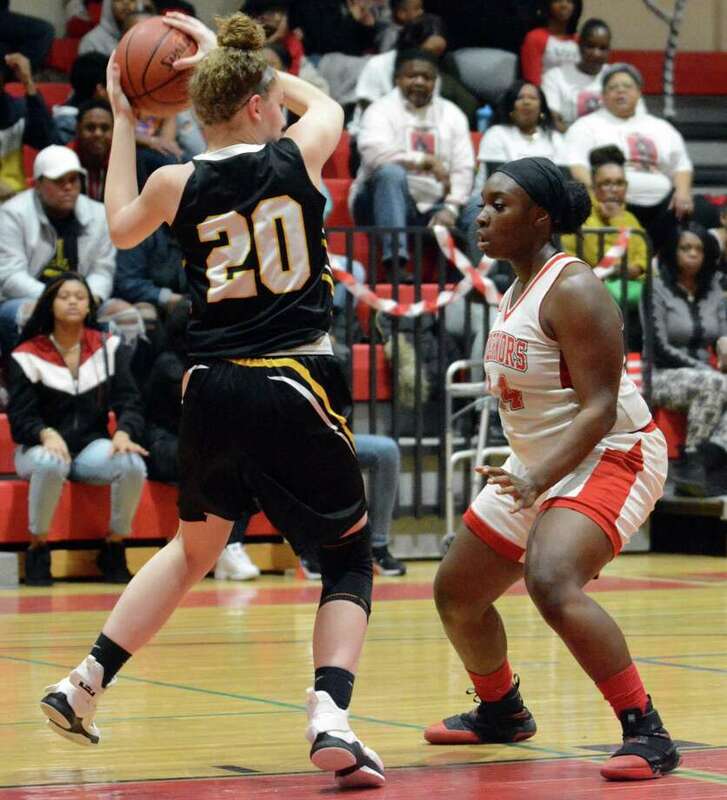 The Wilbur Cross coach knew that his Governors had just survived a furious Hand comeback to grab a 57-55 victory Friday night in a Southern Connecticut Conference girls’ basketball contest at the Robert H. Saulsbury Gymnasium. After coming back from a 17-point third quarter deficit, Hand had four chances in the final 8.3 seconds to tie the game after pulling within two, 57-55, with a 5-0 run in the final two minutes. First, Brooke Salutari missed a three-pointer from the top of the key. Then Nataya Akers had a shot blocked by Jade Hill with the ball going out of bounds to the Tigers. After Summer Adams was whistled for an obvious traveling call with 4.6 seconds left, it looked as if the game was over. Sara Wohlgemuth (game high 21 points) stole the ball just past the top of the key and raced to basket while apparently being fouled. However, there was no call as the buzzer sounded. It was the fourth game that Hand has lost in the last 17 days by six or less points. “That’s pretty much how the last three weeks have gone,” Tredwell said. The big difference for the first 20 minutes was the Wilbur Cross height advantage. The Governors were able to get the ball inside to their front line. Wilbur Cross (14-4) never trailed in the game as the Governors went on an 8-0 run in the first quarter, buoyed by a pair of three-pointers by Kayla Jefferson (15 points) to take a 17-7 lead. Hand closed it to 20-16, but then Wilbur Cross went on another spurt to grab its biggest lead of the first half just before intermission, 35-24, on back-to-back treys by Maddison McAulay. The first five minutes of the second half was dominated by the hosts as the Governors went on an 13-4 run with all of their points coming in the paint as they grabbed a 48-31 lead with 2:28 remaining in the third quarter. But things turned around when Tredwell changed up the Hand defense by stretching out their zone and getting a little more active looking for traps. It worked as Hand went on 14-0 run with Wohlgemuth doing most of the damage, including a lefty scoop shot to make it 48-45 with 4:27 remaining in the fourth quarter. Wilbur Cross was able to build the lead back up to 57-50 on a three-pointer by Jefferson from the left corner with 2:16 to play. Wohlgemuth scored the next five points to close it to 57-55 and set up the frantic finish. It’s the first time since 2011 Hand has been below .500 this late in the season. The Tigers are 9-10 with their final regular season game at home Monday against Hamden.